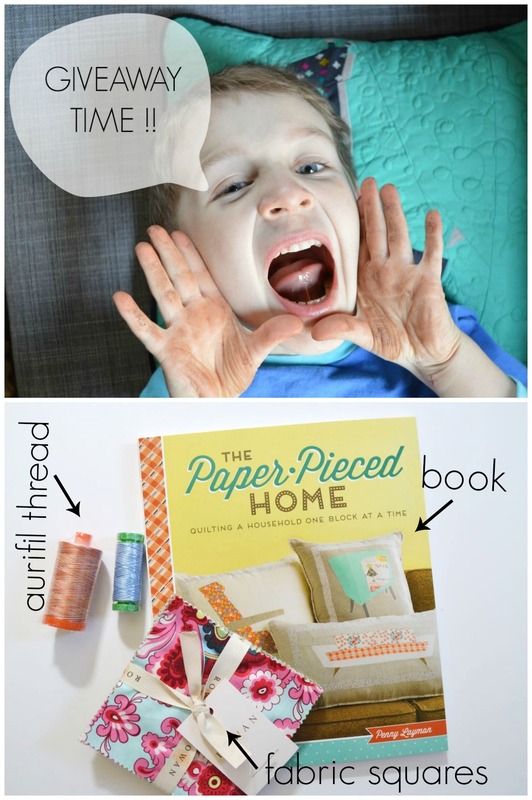 The Paper-Pieced Home :: Book Review, Giraffe Pillow and Giveaway! Guys! I tried my hand at paper-piecing and made a punk rock giraffe pillow! The pattern is from the new book The Paper-Pieced Home by Penny Lawson (more below on the giveaway!) and I’m up next on the blog tour. 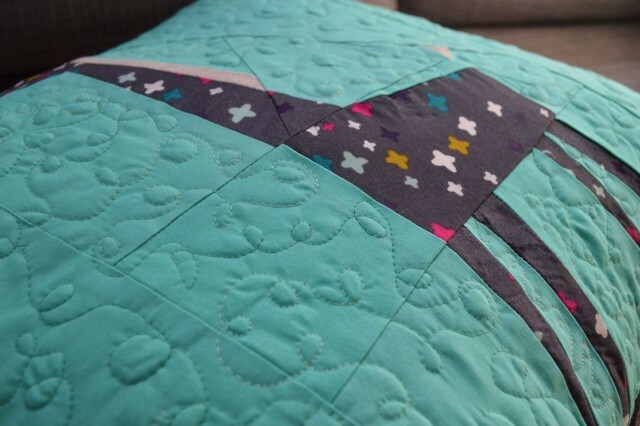 Paper-piecing is one of those mysterious quilting things that people discuss with great fervor but it’s hard to understand what all the fuss is about until you give it a try. I have paper-pieced once before when working on this unforgettable quilt but I was excited to give it another shot. I’m happy with the results, I like this bright, funky pillow. Paper-piecing is everything that people say…meaning it’s super fun and yields amazing results. The folks at Interweave, the publisher, asked me if I wanted to make something from this book and write about it. Considering the promise to myself of creative adventuring and taking on projects that bring me joy, I decided to go for it. I want to get better at paper piecing and this seemed a super fun place to dive in. Now, before I get into the book and details about this pillow in particular, I have to say that I intended for this pillow to live in the boys room but this guy, up there, kept dragging it down to the living room until I gave up and kept it there. He has plans for this pillow and they involve cuddling during movie time. I can’t say no this face. Could you? Ok, back to the book. The subtitle of the book is “Quilting a Household One Block at a Time” and it includes 40 different paper-pieced blocks and 14 projects. The design is super retro with rotary phone blocks, box tv set blocks, layer cake blocks…it’s so fun. But, Penny keeps it classy by using linen and quiet colors so it’s retro without being retro-tacky. Know what I mean? It’s a tough balance but she’s good at it and even discusses how to make balanced fabric choices. She describes how to paper-piece thoroughly, as well, so it’s good for beginners to paper-piecing. If you have never paper-pieced before it’s actually kind of genius (yes, I’m am now one of those people hyping it up). You sew onto paper that has been printed with an outline of what you are making. Sewing bits at a time and following the instructions closely, you can make literally any design. There is obviously more to it but that is the main idea. The book walks through all of that and includes all level of projects. It a great technique but it did take me a bit of getting used to and some of my seams aren’t lined up perfectly. As a beginner myself, I found the book clear and straightforward. Penny makes it easy to follow. There was only with one exception. The book didn’t give me enough guidance on how to cut each fabric piece the right size. I sometimes ended up with very small seam allowances. So, I would say err on the size of cutting your fabric pieces TOO big. Either way, the resulting pillow is pretty fun and the whole thing is made with scraps of fabric. I love a project that helps me diminish the scrap pile. The back of the pillow is envelope style closure, also from leftover scraps. I decided to practice free-motion quilting on the block background which served two purposes. For one, it made it look pretty but it also diminished the visibility of the seam lines. Now for even more fun stuff, I convinced the publisher to give me a book to giveaway and I added in some of my goodies to help the winner jumpstart their paper-piecing good times. Leave a comment here to win the book, the fabric squares and 2 spool of variegated aurifil thread! Tell me anything you want, I just like to hear from people! (If you want to be really helpful, tell me what color you think we should paint our living room, as you might have noticed in the first pic, we can’t decide.) The giveaway has ENDED! THE WINNER is April Demroff, look for her on IG as “SewCharmed”. Watch your email April!! The fine print: one entry per person (U.S. entrants only. Sorry, I cannot afford international shipping). Be sure I can see your email, so I can be in touch if you win! J will be so mad if you win and I can’t get in touch with you! Don’t mess with J. This book is going on quite an impressive blog tour. And, the results are really exciting and fun, including an awesome rotary phone quilt and Andy Warhol-inspired watermelon. Don’t miss it! Disclosure: This book (and the giveaway book) was provided to me in exchange for this blog post. My thoughts on the book and the choice of what I made are completely my own, as always. I love the giraffe and like the gray color! I love paper piecing! It is fun and the end result looks so much more perfect and time consuming than it actually is. And who doesn’t love that kind of project? And I have really been eying this book! And gray for the walls!!!! Gray is the most perfect neutral. Everything just works with it and it is so subtle to the eye. That looks so cool! I would love to give this to my sister who loves to sew! That little guy must keep you very busy! I suggest painting the walls the light blue that is in the back of the pillow you made. The blue makes your couch pop. Ok, first of all, I’ve never been able to say no to that face so here I am commenting, J, just for you! I’d really love to learn how to paper piece, I mean, just look at that giraffe! Maybe if I win this book, I’ll take that as a sign and get to it. And as for your walls, I’d do a soft cool grey (which I used for my newly finished (YAY!) bathroom. It’s such a pretty color and is a great canvas for your crafty self. Love your pillow – totally fun colors! Speaking of color, I love the new sea blue gray tones – kind of a misty gray sea foam ( like Joanna Gaines has been using in her renovations ). Your couch is neutral and your cute new pillow would coordinate as well. I’d certainly put this book to good use – so many of the ideas would make great gifts – I’m trying to tackle my Christmas handcrafted list a bit earlier this year ( better than waiting until Dec. 1 to start!) Thanks! 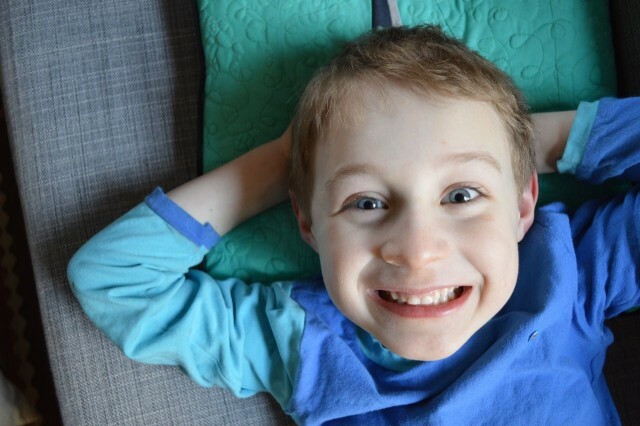 Perfect fabric choices for that fantastic pillow! J is just the cutest, btw. I would like to get better at paper-piecing. If I win this book, I may start with the retro tv project – so cute! Your pillow is so cute. I am glad it is loved. I’m enjoying this book tour. Great projects. It’s been fun hopping to the various sites and seeing what projects you creative folks have sewn up. This looks like a fun book. By the way, for your living room color, I would go with a pale grass green. That would look good with your couch. I love to paper piece and these blocks are super cute! Fabulous pillow! After many neutral colored walls, I painted a small powder room about the shade of aqua in your pillow. I love it, but my husband, not so much! For big rooms I’ll still probably stick to neutrals. Well, I was going to suggest brown (dark taupe) or similar because my sister’s living room is painted that color, and I just love it. But then I scrolled back up to your top photo, and the room is already brown! So you must be wanting a new color scheme. hmm….maybe just a lighter neutral. Great giraffe pillow! Paint it gray…I painted my sewing room a bright coral, but am thinking my living room will be gray…I would love to start paper piecing if I win. Thanks for the chance! Oooh… you really did it up in the giveaway department! The wicked cool book AND thread & fabric. I’d love to be the lucky winner. I can already see a sea of very fun PP pillows taking over my couch! How cute! 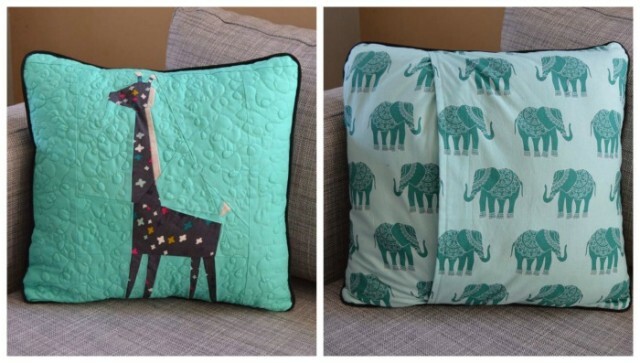 I would love to make a giraffe pillow for my daughter’s room. The blocks all looks so cute. Paint your living room yellow. No matter what the weather you’ll feel like it’s a sunny day. This book seems great! I can see these types of pillows in my living room (which is Benjamin Moore Grasslands if you are still looking for a color!). It’s such a pretty color teal! I love your giraffe almost as much as your son. You should be super proud he wants your work so close to him. I would go with the gray color on the wall with the window. Hope I win this book – I love to paper piece and retro is so fun. 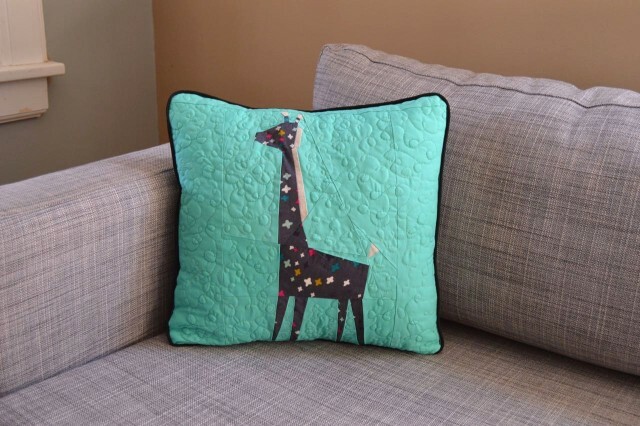 Giraffes are one of my favorite animals, and I love your fabric choice for making the pillow. Your son is a cutie-pie, too! The more I see of this book, the more projects I want to make! 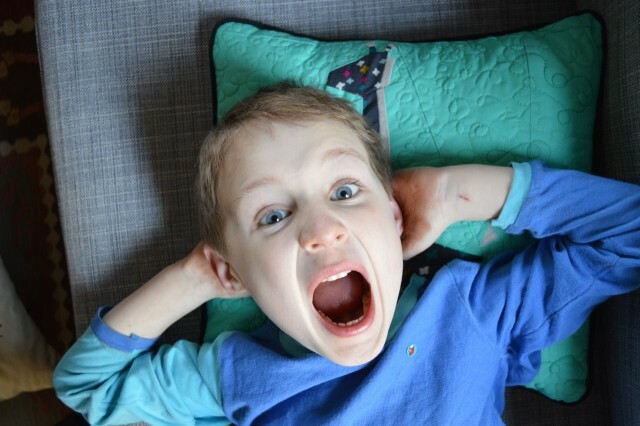 I can see why your little guy loves this pillow…it is so cute!!! We went with the darker accent wall, and then painted the rest of the living room the lighter color. Looks awesome now. The giraffe is darling…I remember making something like that many years ago when my kids were in pre-school and one of them was in the “giraffe” class. I think I made a pillow for his teacher. Thanks for sharing the giveaway! The giraffe is cute and that little help you have is darling! Very cute pillow! As for the living room color, I love the grayish tone on the left with your couch. Thanks for the giveaway! Love love love to paper piece. Thanks for the chance! I am in the middle of trying my hand at my first paper-pieced item. It is for my daughter and I’m really kind of winging it! Maybe this book would actually help me not make a complete disaster of things! As for the paint, all I can say is good luck! We are also trying to decide what color to paint. I want to do a light grey, but the curtains in the living room are a tannish color and I don’t want to replace them so I will probably just be boring and go with a bright white. I mostly just care about the trim which the previous owners painted a brown that I hate. I love your giraffe! The pillow turned out really cute. For your wall I would suggest a pale green tea color. I love paper piecing and would like to have some more patterns! I like the reddish color – can’t see either very well :(. All of my walls are light grey. As much as I love color, my hatred for painting trumps that. I know if I pick a color I will eventually get sick of it and then I will have to paint again. So keeping it grey is my lazy solution, I can add color with pictures and stuff! I really like the cool grey color. We painted our hallway with that color. And I want to use it again in another room. Love the paper pieced giraffe. I enjoy paper piecing. The precise points are wonderful. Your giraffe pillow is so very cute. My living room walls are painted sandspit, it is a sand like color. I am liking this book a lot. I agree with some of the others and would go with a light gray. Very cute pillow, I like the back too. Oh my goodness I have to make that giraffe! Love them! The giraffe pillow is almost as adorable as your little boy … his expressions are precious. Thank you for the chance to win the book. A great giraffe! Go for the lovely grey. A perfect backdrop for pictures and quilts of any color. Cute Giraffe, great job. As to the wall color, a soft grey seems a better choice than the tan with the couch you have but hard to tell since the rest of the room is not on view. Not that I’m that brave because I usually go for safety with a light ivory and put the color in slipcovers. That giraffe turned out so stinkin’ cute! I am a terrible decorator, so you definitely don’t want my opinion on paint colors. However, I always go with light colors on my walls like pale blue! I’d like to make a giraffe, too. I love your colors. I’m glad you enjoyed paper piecing! I love dove grey which might be a great color for your walls. Love your giraffe! . And I love to paper piece. Thanks for the chance to win. Love your giraffe! Can’t help with the paint color. I had a couple of rooms painted last week and just threw in the towel and used the same color “Ramie” as the hall. Too hard to pick another one. Good luck. I love your giraffe! I am guessing that the little “horns” (?) are the hardest part – so tiny! I think if it were in my house, I would constantly be sneaking it into the livingroom too; it is adorable! I have been eyeing this book and it will probably be added to my quilting library even if I’m not the winner here. Thanks for the chance to win! I would love to help you pick your new living room color, but I’m in the middle of a remodel right now (too many choices). I have only been quilting for a little over a year. I am interested in paper piecing, but have been putting it off because everyone’s paper pieced stuff looks so darn perfect. I love your giraffe and review of this book. It looks like this might be the perfect way to start. I think my little ones would love the things in this book. The more I see of the things made from the book, the more I think I need to buy the book. This is definitely going into the folder labeled “Gifts for Nancy”! I love how you used the cotton and steel print for the body of the giraffe! 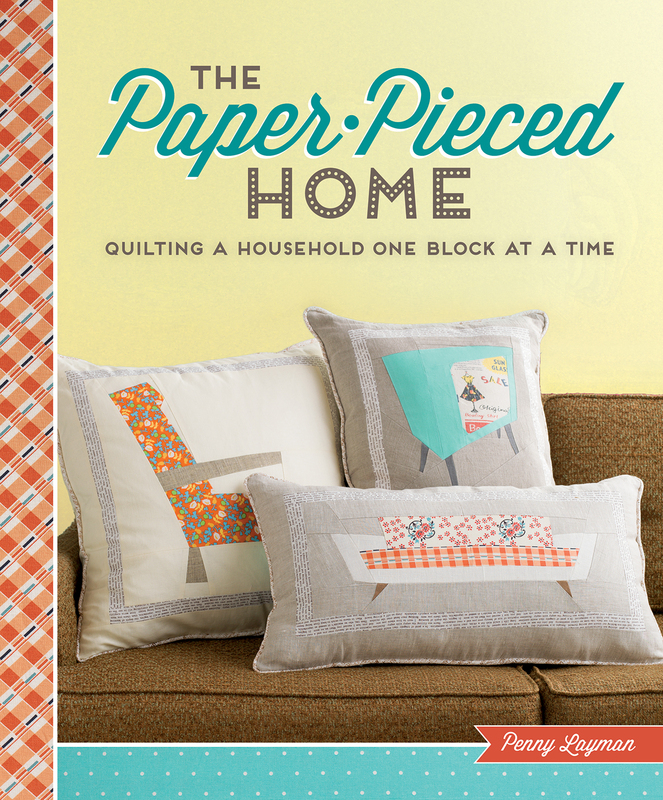 This book sounds like the perfect fit for me to give paper piecing a try. 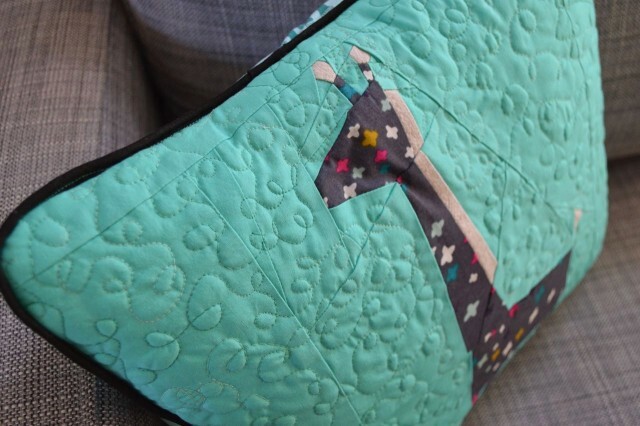 I love all the photos of projects that the bloggers have made….especially your giraffe! I would love to paper piece a black bear for my husband’s office. He’s a bear NUT! As far as your paint color, we painted our family room a color called “Croissant” a few years ago and it’s the perfect neutral color that goes with everything. The book looks awesome! The giraffe seems to be more inclined towards the gray. I would trust giraffe’s impeccable taste in home decor. I love the cute little giraffe. It’s almost as cute as your little guy. My “little” guys are 16 and 21…enjoy those precious years. I know that paper piecing is supposed to help you be more accurate without all the work, but I like small imperfections…it’s the human touch. Brown please! It looks like honey and it matchs pefectly with the sofa and your new cushion (I loooove it)= :). I’m new in paper piecing, so I bet this book will be a “must have”. That giraffe is too cute! Paper piecing is so fun, but I have never done anything that intricate. Looks like a great book! Paper piecing is always fun! I need to breathe some life into a pair of tired living room pillows, and this would be the perfect book to update my look! Try grey paint – it’s the new beige according to the guy at the paint store! LOL we just painted my son’s room and it came out beautifully!! !